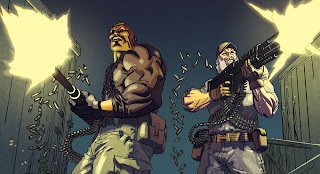 Mike Hawthorne: ORIGINS #4 - super sneaky peek! My pal and boss Chris Ryall showed this over on this blog, so I figure it's cool to show here. I'm guessing the character on the left is the new Heavy Duty character. Either way, the lighting on his face is fantastic! Reminds me a lot of a cover that Michael Golden did of The Nam. Completely different characters and poses, just the way the muzzle blast was highlighting the facial features. Yeah, that's Heavy Duty. The other dude is Rock & Roll. Glad you dig it, man. Yeah, wow! Mike Golden! Thanks!